Beveled stained glass suncatchers can be constructed in a variety of sizes and shapes however because of the cost of the bevels used in their construction, they usually command a hefty price. The beveled Marlin Suncatcher above took over a week to construct and is an example of what can be done with bevels. The glass used to construct the water is a Steel Gray Blue Waterglass cut in the same direction, and the seaweed was constructed from Kokomo Rough Rolled Green. The marlin bevel set was purchased from Delphi at a cost of over $ 100.00. The suncatcher measures 19" in diameter and has a came border with a gold plated hanging chain. To finish off this project, a black patina was used to give the project a "regal" appearance. Beveled glass can also be used for wall hangings and window panes but they show off the most light when you see them hanging in a window, shooting beams of multicolored light across the room. 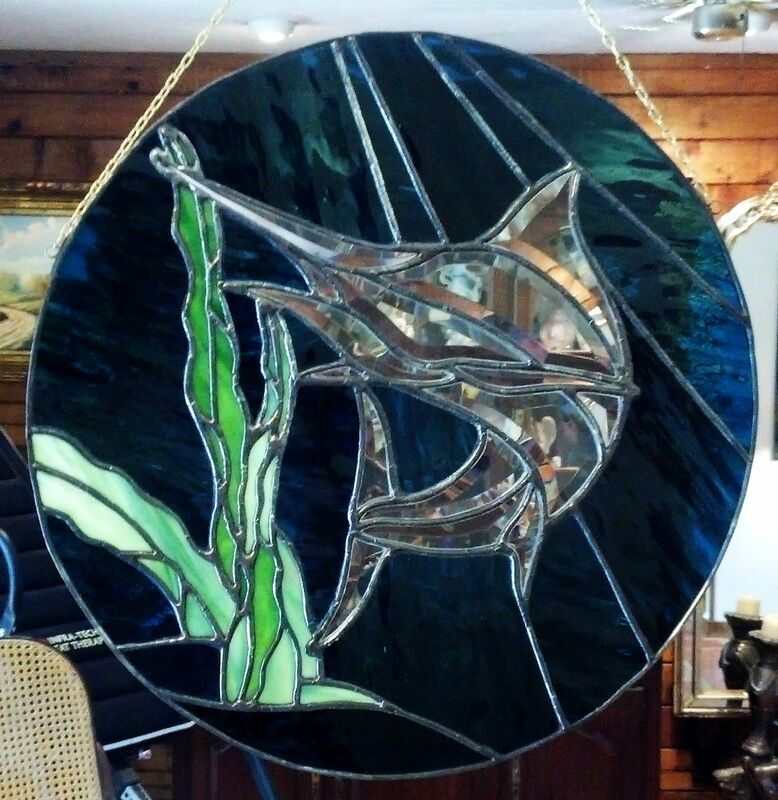 The Marlin Suncatcher above can be found in the Artist Suncatcher Gallery and is available for purchase. The next time you order some stained glass or supplies, check out the bevel glass sets available and try your hand at a beveled stained glass suncatcher.